If you track event attendance, you can import that data into custom, searchable fields in the EverTrue platform. Using a map-based search, you can add a filter to find large numbers of these non-engaged alums within key areas. Create an event to try to reach these constituents, then export the list you’ve found in EverTrue to use for email marketing. You can also create a targeted print mailing to send to these people to try and acquire new contact information by inviting them to log into your alumni app or website. Using the 'Engaged on Facebook?' filter, we can see where our unengaged alumni are based. 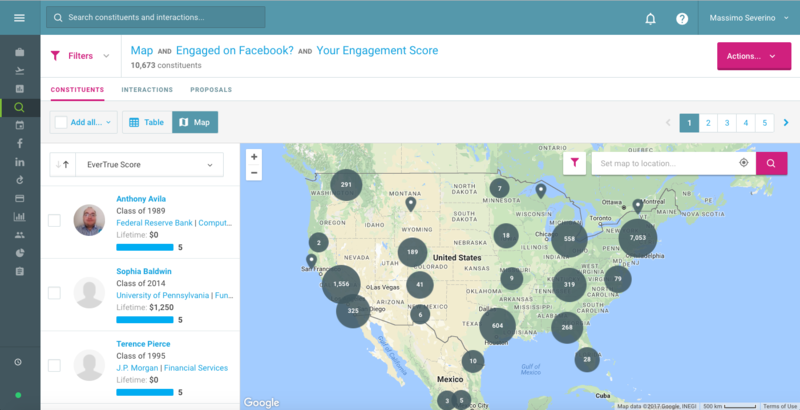 Results: Create targeted, location-based lists of disconnected constituents and outreach strategies to connect with them.